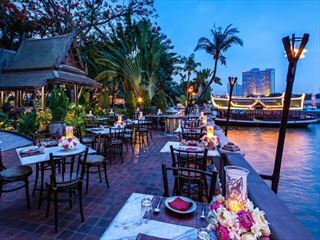 Located along Silom Road, the hotel places you in the centre of the myriad shopping, restaurant and entertainment highlights, and you’ll also be close by to the gorgeous Chao Phraya River. 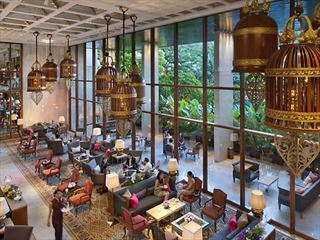 Set back a little from Bangkok’s famed points of interest in addition to its bustling shopping and business districts, you’ll be in the perfect spot to unwind and still enrich in everything the city has to offer with fantastic transport links nearby. Wander down the picturesque riverfront to Asiatique, a popular evening venue for shopping and eating with a plentiful variety of restaurants and boutiques to choose from. Lots of temples, monuments and other historic attractions can be found close by, including the Wat Suan Phlu temple, the Assumption Cathedral and the Wat Yan Nawa temple. A complimentary daily shuttle bus can take you to the SkyTrain, which provides great opportunity to explore further afield. In the heart of Bangkok, you’ll find a magnificent wealth of gorgeous parks, grand monuments, museums, galleries, restaurants and bars. 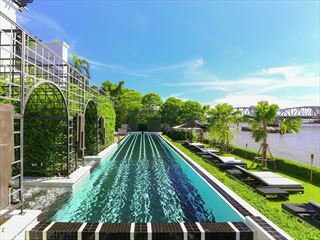 • It's a 40 minute drive from Suvarnabhumi International Airport. All Suites have a private balcony and a kitchenette with DVD and CD Player in the living area. 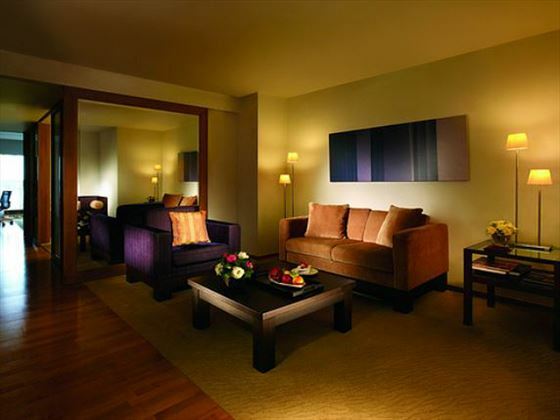 Tower Club River View Suite – the same amentities as above only with River Views. 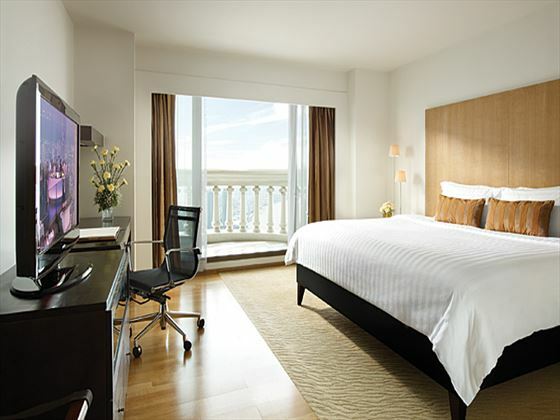 Tower Club Signature Suite, 2-bedroom – double the size of Club Suites with three city view balconies, one king-size bedroom, one twin bedroom, two bathrooms, living room and dining area. 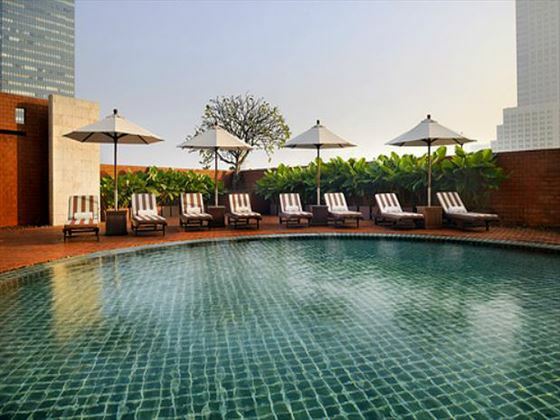 Tower Club Luxury Suite, 2 bedroom – same size and features as Tower Club Signature Suites with added benefit of personalised check in and check out services and upgraded amenities. 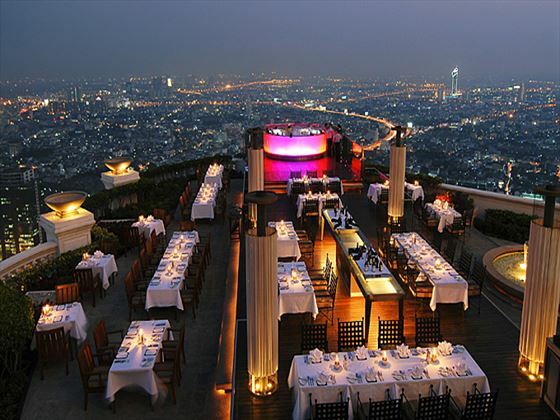 Tower Club Lebua Suite, 3-bedroom – around four times the size of Club Suites with four city view balconies, two king-size bedrooms, one twin bedroom, two bathrooms, one guest bathroom, living area, dining area and personalised check in and check out services. A great option for parties of up to six people. Tower Club Hangover Suite – a unique suite (same size as the Tower Club Lebua Suite) themed around the movie with plenty of VIP treats and upgraded amenities, including complimentary minibar and Hangovertini cocktails on arrival. 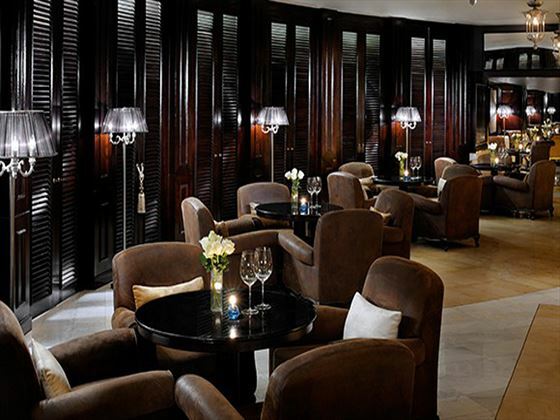 Breeze – award winning cutting edge Asian cuisine served alfresco every evening on the fifty second floor. Café Mozu – an incredible array of authentic Thai, Lebanese, Indian and western specialities served all day in Middle Eastern chic surroundings. 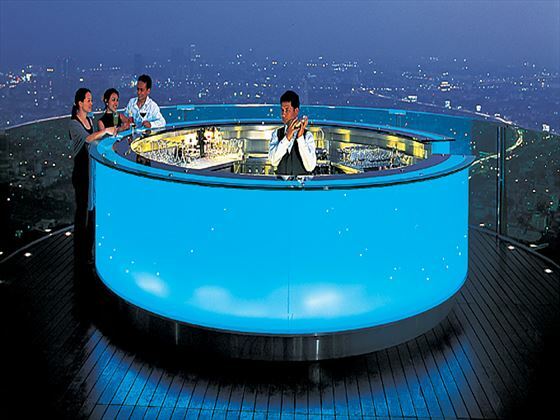 Distil Bar – innovative and stylish cocktails with an indoor and outdoor setting accompanied by chilled out DJ tunes and the highest bar views in Bangkok from the sixty fourth floor. Mezzaluna – Michelin star trained chefs present the very best in European and Asian cuisine every evening from Tuesday to Sunday. Sirocco – award-winning Mediterranean fare presented in an incredible open air space on the sixty third floor accompanied by a warm breeze and live jazz. No. 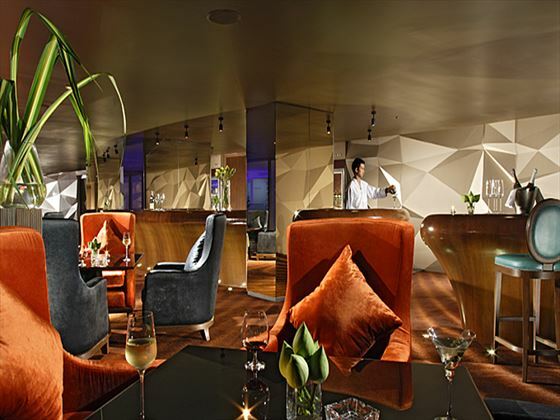 3 - the world's tallest abd Bangkok's newest upscale Gine, Caviar & Vodka Bar offering gorgeous views of the city skyline and Chao Phraya River. Chef's Table - the art of cooking is right at the heart of this elegant and sumptuous dining experience. 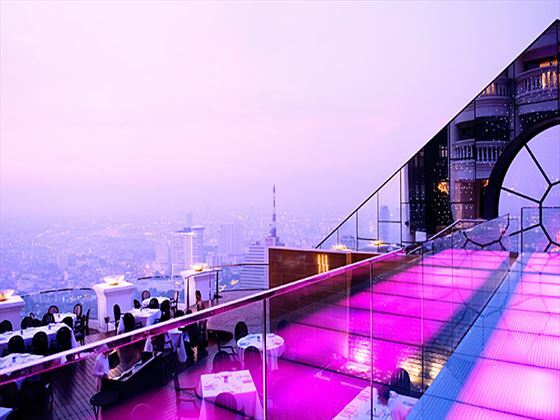 Sky Bar – this is most definitely the place to be in Bangkok after dark. In-suite dining - your choice of dish presented in the sanctity of your suite on a 24 hour basis.